People from various industries were gathered at The Peninsula Manila for the Token Hub Asia's #Applaunchparty2016 held on October 20, 2016. It was also the 1st anniversary celebration of Token Hub Asia. A welcome message was delivered by Mr. John Raphael Flor, Vice Sales and Marketing Manager and Acting Chief Executive Officer of Token Hub Asia here in the Philippines. He discussed about the innovation, technology and the business as the future of financial services in the country. He then introduced the team who attended the event as they came all the way from Tokyo, Japan. Key persons from Atom Solutions Inc and Eternal Link in Tokyo were all present during this launch. Mr. Onodera Toshiaki, President of Eternal Link in Japan sent a video message as he talked briefly about its operations and now it has come here in the Philippines, lastly he then again introduced Mr. Flor for his product presentation considering he was even surrounded by people with their curious minds about the service and how the system works. Flor gave the guests a concise but informative background of the other business models within the same concept of Eternal Coin and its services. The presentation has given its emphasis on the low cost money remittance in which Token Hub Asia, its local exchange is embracing as part of its corporate branding. The ELook application is now available for the android market through Google Playstore was likewise introduced and taught the guests on how they can download given its benefits once they become part of the Token Hub Community. ECounter or being an accredited money transfer agent was even more interesting because Filipino people would really want to have an additional income and extra aside from their regular 8 hour job that they all do. Right after the presentation, the Eternal Coin was finally unveiled to the public and it is now officially here in the Philippines. 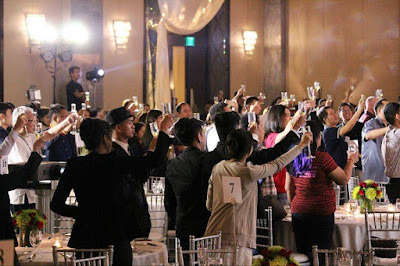 Mr. Flor and Ms. Jefferjane Rufo, the Marketing and Events Officer of Token Hub Asia was joined by Mr. Clement Tiong Sii Jie of Eternal Link in Tokyo for the toast of success. Everyone seems to be very overwhelmed and has been wondering the direction of this company when it comes to their local operations. Sumptuous dinner was served and game surprises were presented after each segment of the program, including the “Facebook Like Contest” and Best Dressed. It became more exciting when popular cosplayers in the country were present and they were all fascinating. Cos-crew website from Japan was even introduced to the Filipino market since the local cosplayers are all registered on this site prior their appearance that night. There were also 3 winners of Eternal coin and they were rewarded by coins transferred to them directly on the spot and got even excited when they found out that these are convertible to cash equivalent. Gerhard Krysstopher and Rissey Reyes who are both cast members of Hi-5 Philippines and TV commercial models graced this momentous event.